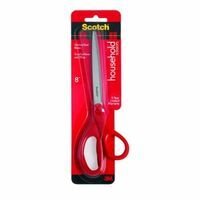 Scotch Home and Office Scissor, 4.62 in Length of Cut, Stainless Steel Blade, Straight Handle, Red Handle, 8 in Overall Length, For Multi-Purpose Applications Stainless steel blade. ABS handle. Comes in assorted colors. 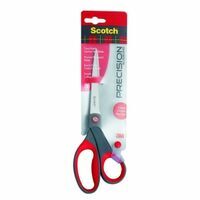 Sharp and comfortable all-purpose scissors. Durable, hardened stainless steel blades. Contoured handles designed to fit your hand. Handles contain 30% post-consumer recycled plastic. 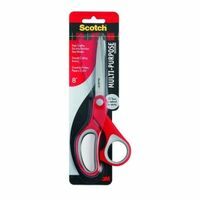 Scotch Multi-Purpose Scissor, Series: Designer, 3-3/8 in Length of Cut, Stainless Steel Blade, Straight Handle, Gray/Red Handle, 8 in Overall Length, For Multi-Purpose Applications Taper ground for superior cutting. Premium 3cr13 stainless steel blade. POM handle.